When he woke up this morning, I asked the birthday boy what does he want for lunch. Without hesitating, he said “icy chicken and dirty rice”. It took me awhile to understand what he meant, then I realized he meant Hainanese chicken rice. Icy chicken, why you ask? Because he saw me dunk the cooked chicken pieces into bowl of iced water. This step is crucial to us, because we like how the skin turn gelatinous after. It gives a cartilage-y crunch to it. Dirty rice, well, the rice is cooked with the water used to boil the chicken. I still find it super cute, the way he named this dish. It is pretty simple, and not so laborious. Here’s the recipe. Boil the water in a pot on high, large enough to hold all the chicken pieces. Add in all the ingredients. Turn down the heat so it simmers, but not boiling like crazy. Cover and wait til the chicken is thoroughly cooked. Prepare a bowl of iced water, and dunk the cooked chicken pieces in there. Careful, you don’t want to destroy the chicken and try not to pierce the skin. Heat the oil and stir fry the garlic and ginger until fragrant. Add in the rice, fry until translucent (not too long). 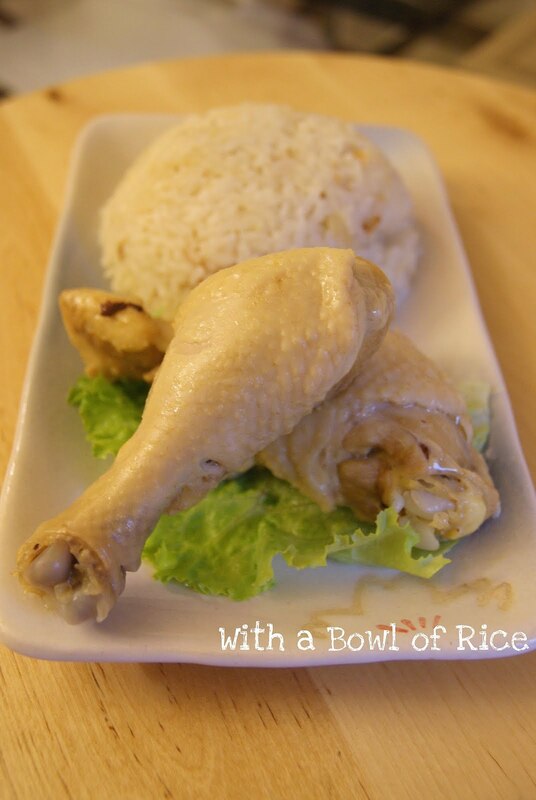 Pour the rice into rice cooker, add in the water used to cook the chicken as needed. Cook it as you usually cook rice. Serve it with whatever you like. While I prefer to eat it with ginger chilli sauce, my son loves it with soy sauce. There are so many ways to serve this, it’s endless, depends on your creativity. You can re-boil the chicken broth and add some chopped scallions for soup. Or toss some cilantro on top of the rice. Or fan some sliced cucumbers around the plate of rice. Or make few dipping sauce, it could be ginger chilli sauce, chopped chilli with soy sauce, or oyster sauce; whatever floats your boat. 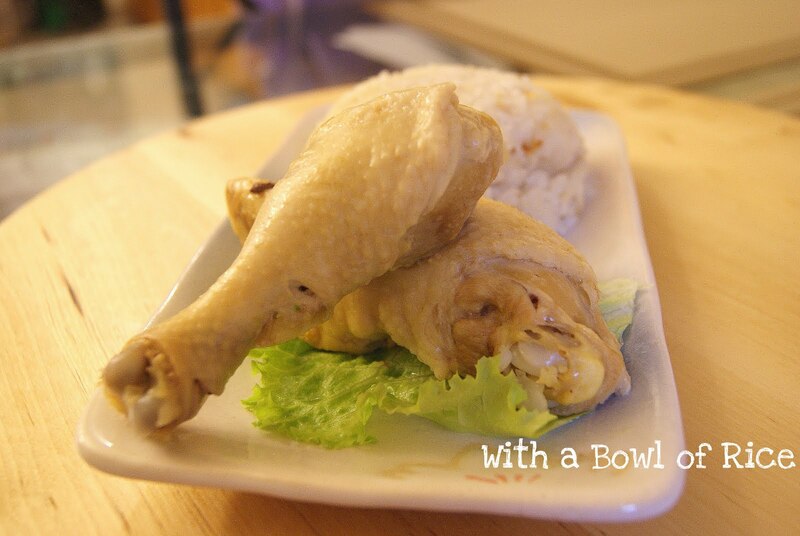 This entry was posted in In my kitchen, Lunch, Poultry, Recipe included, Rice. Bookmark the permalink. That is such a unique name for a meal. You got me on the icy chicken. Never had that before! My daughter LOVES skin on chicken. I think she'll prefer that over the meat. My mom just put one up too and I've been seeing it on other blogs too. We must all have similar cravings. @Mariko: we all love chicken skin. Always fight over it. Wait til my son tries to claim the cartilage too, I might cry….. Although not very appetizing name, this looks good and with these simple ingredients(which I already have), I can make it tonight! @Nippon Nin: hahaha that's what happened when you let a 4-yr-old named the dish! @J: haha I tried the packaged spice paste once, but realized it was just minced garlic and ginger with a bit sesame oil and chicken bouillon powder. Which I already have at home at all time!